is probably due to the characters somewhat odd gimmick. Madame Fatale is, of course, a crime-fighting persona, with the character's alter ego being Richard Stanton. 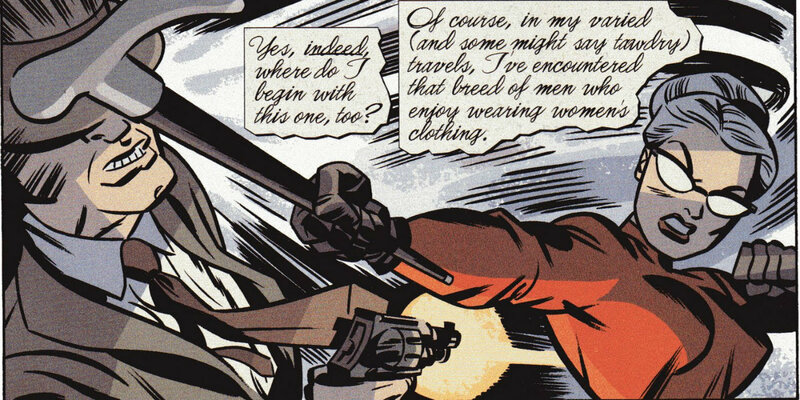 That is right, Madame Fatale is actually a "he." Richard Stanton is a world-famous actor sitting on a Wall Street fortune, but his love for the theatrics led him to fight crime dressed as an elderly lady – lending him the element of surprise. Being in peak physical condition, trained as a skilled hand to hand combatant, and containing an incredibly high level of intellect serves to make Stanton appear somewhat useful, but his elderly woman prosthetics probably cause more harm than good when fighting crime. Not to mention, while the old elderly woman trick may work once on his various foes, that whole "fool me twice" saying comes to mind, perhaps making the streets unsafe for actual female senior citizens.